The Cynosa Chroma is an entry level, spill-resistant gaming keyboard. It comes with options of customizing each backlit keys individually. The Razer Cynosa Chroma was launched in US in October last year. Kaira Global Technologies has lauunched the keyboard in India priced at Rs 4,999. It is an entry level spill resistant gaming keyboard, which allows users to customise each key with 16.8 million colour options. "Razer is undoubtedly known as a company for their robust and high-quality gaming accessories. Unsurprisingly, that continues to be the case with the Razer Cynosa Chroma line of keyboards. The keyboards are feature rich entry level products best made for beginners or casual gamers. The ergonomic and spill-resistant durable design, simple set up and LED backlighting are a perfect mix of price to performance ratio," said Manoj Attal, Director at Kaira Global. 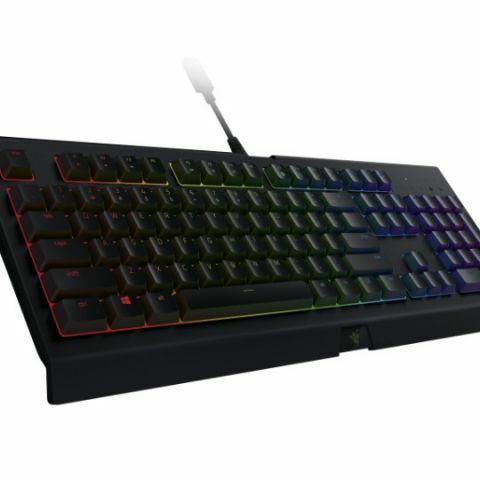 Kaira Global Technologies, an IT distribution house driven by the passion to provide customers quality products, today announced the availability of newly launched Razer Cynosa Chroma in India. Cynosa Chroma line of products are feature-packed but value-priced family of gaming keyboards complete with the personalization and immersion factors that gamers need. "Razer is undoubtedly known as a company for their robust and high-quality gaming accessories. Unsurprisingly, that continues to be the case with the Razer Cynosa Chroma line of keyboards. The keyboards are feature rich entry level products best made for beginners or casual gamers. The ergonomic and spill-resistant durable design, simple set up and LED backlighting are a perfect mix of price to performance ratio," said Manoj Attal, Director at Kaira Global. Unlike other value keyboards, each key on the Cynosa Chroma is customizable and individually backlit with 16.8 million color options. Officially integrated lighting profiles that change dynamically during gameplay can be activated upon installation for "Overwatch," "Quake Champions," "Diablo" and other popular games. The Razer Cynosa Chroma is the first Razer keyboards interfacing with Razer Synapse 3 (Beta) software. Synapse allows users to choose lighting and performance parameters, including their own macros and key binds, and it can be accessed from any computer. The newest version of the cloud-based configurator allows more customization than ever before, with new lighting effects, settings and more. Razer Cynosa Chroma comes with MRP of Rs. 4999/- and is available with Kaira Global Technologies carrying the warranty of 1year. What is the best gaming keyboard ?